Cherry Blossom Events’ Andrea VandeBerg and Sarah Sarbacker were going for “a real ‘wow’ factor” with this 10-foot-high floral wall design. Created for Kyle Herma and Taz Landry’s 2017 wedding at the Historic Pritzlaff Building in Milwaukee, this vision was brought to life by Dahlia Blooms and Majic Productions. Hydrangeas, roses, phalaenopsis orchids, spray roses and stock combined for a ceremony setting of glowing jewel tones. 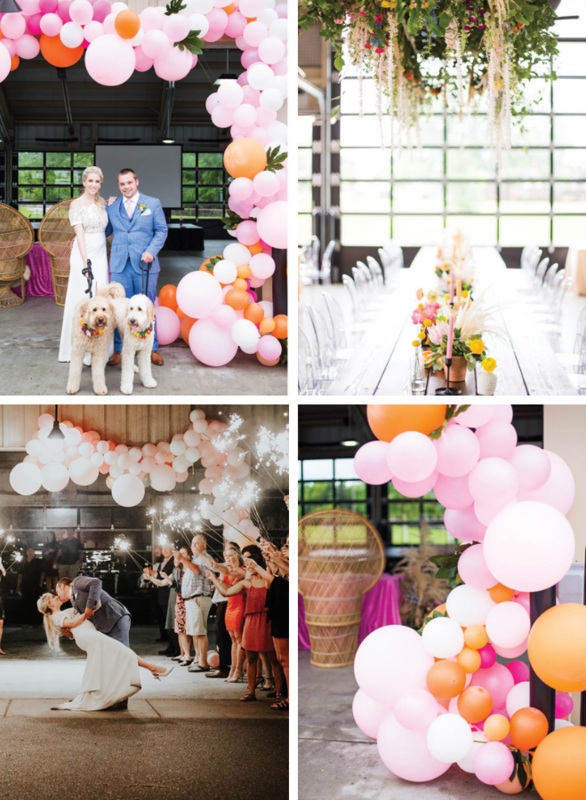 Summer bursts forth in this fun-loving balloon installation at Abby and Zach Ficek’s 2018 wedding at Heinzen Peaceful Valley Pavilion in Antigo, planned by Et Voila Events. The bright pops of pink and orange recur in the hanging floral installation by Ebb & Flow, for a light-hearted and lively evening. “We wanted a traditional chuppah,” says bride Connie Gaines of her 2018 wedding at The Farm at Dover, planned by Heather Farr Events. Flowers for Dreams designed a cedar chuppah structure wrapped with lush eucalyptus and smilax vines, and a pop of bold seasonal flowers, including hydrangea, peonies, roses, stock flower, and snapdragon. She and groom Rick chose the blue and silver tallit together to serve as the canopy. Why choose between indoors and out when you can have the best of both? 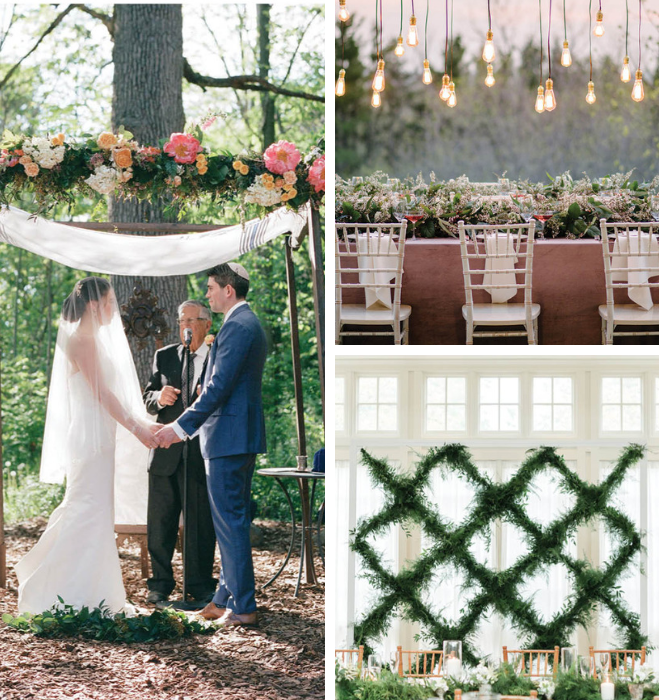 Edison bulbs create a dream-like installation, while the fresh greenery brings nature to the table in this recent décor shoot, a meeting of the creative minds at Relax Event Planning, daffodil*parker, Chance Productions and Azena Photography. Dinner with a view: This lattice wall, made from handcrafted fern garlands, looks like it’s growing right on-site at Molly and Matt Minga’s 2017 wedding at Paine Art Center and Gardens in Oshkosh. 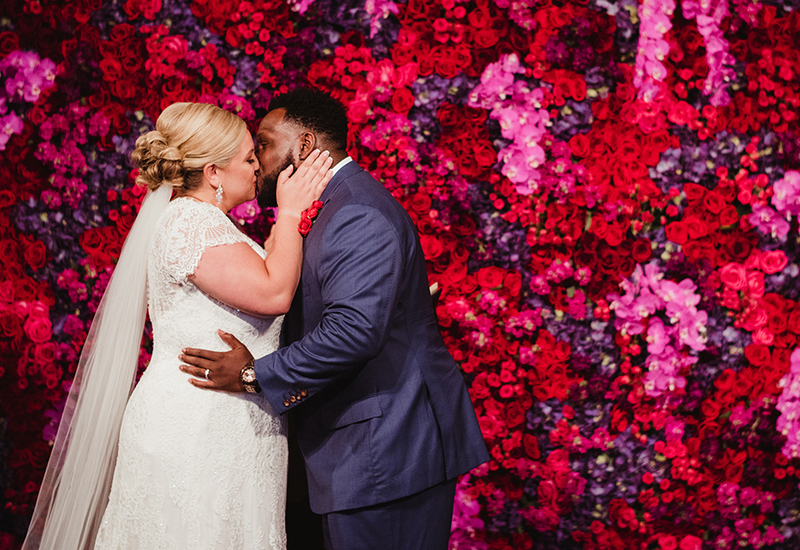 With help from Elevate Events, House of Flowers and the bride’s father worked together to bring the bride’s vision to life, proof that talent—and love—add up to beauty. 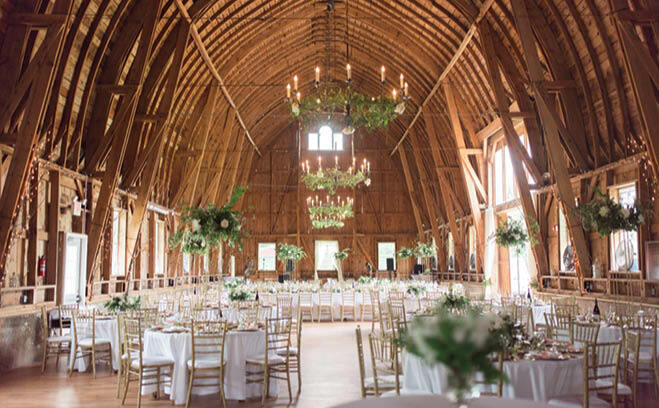 “I love how [these] installations were created with very simple greens, but still made a giant impact,” says Kirstie Warren of Elevate Events on the installations she and daffodil*parker designed for Julie MacGuidwin and Bryant Steele’s 2018 wedding at Sugarland Barn in Arena. 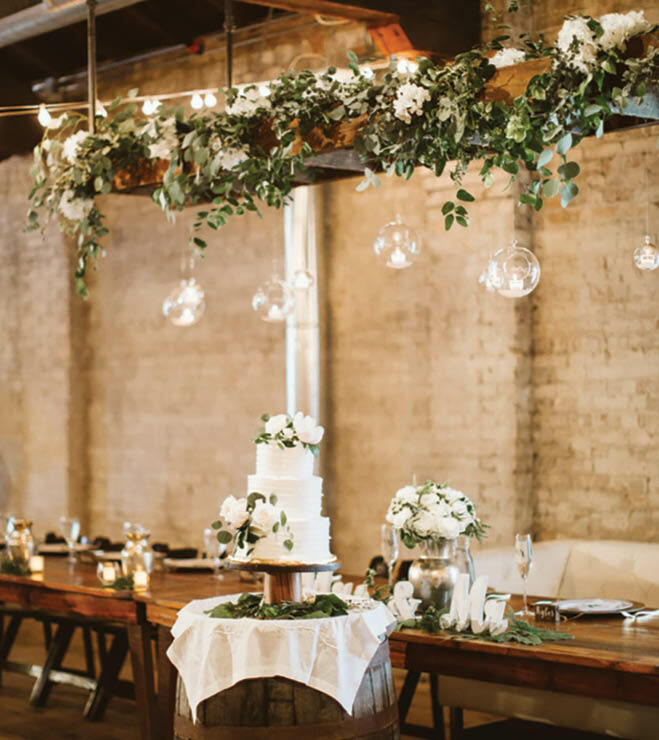 These chandeliers, dripping with smilax garlands and ivory peonies, add a soft, romantic touch to the rustic structure. A little greenery suspended with twinkling lights and candle globes adds a hint of whimsy to an elegant dessert table, created with foliage from Hy-Vee and flowers from Flora by Jamae for Kyler and Brittany Nixon’s 2018 wedding at the Lageret in Stoughton. 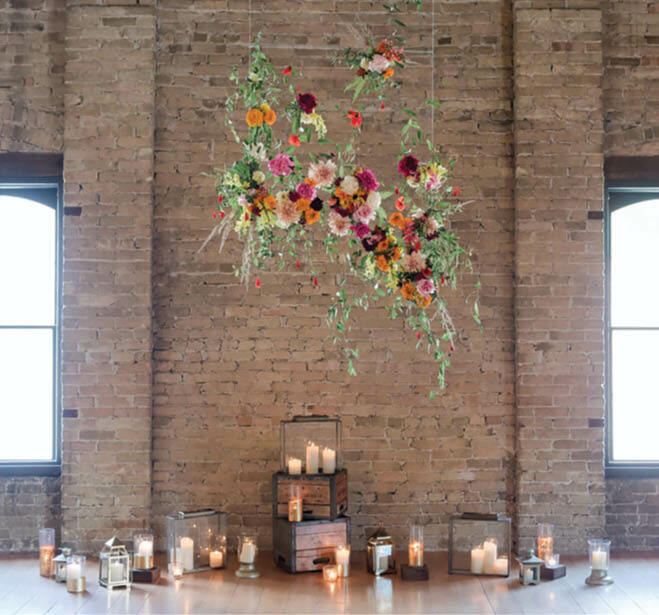 This gorgeous floral ombré installation seems to float, hovering just above where the couple will say their vows. That was exactly the goal of Mallory Wedel of Elevate Events, who collaborated with Flora by Jamae to design this spectacular creation of dahlias, mums, carnations and hardy greens.